Are there examples of spiral duct installations? You can find them in the Chapter #57 of my Ductwork Installation Guide e-book. Are you supposed to turn furnace off in the summer? If there is no AC then answer is yes. Can a gas line run through the cold air return duct? Yes, unless there are restrictions in your local code. Can bathroom exhaust and dryer share same outside duct? Code prohibits them sharing the same duct. Can be a condensate pump discharging into the crawlspace? Can ductwork be run through the attic? Of course, if ductwork installed in the attic it runs through the attic. Can I cut a cold air return into side of trunk? Yes. Should be 10' away from the water heater or gravity furnace. Can I cut into duct to let heat in basement? Can I insulate my ductwork and cold air return together? Yes, but do not forget to put one layer of insulation on the supply duct. Read more in the Chapter #55 from my Ductwork Installation Guide e-book. Can I save energy from insulating exhaust duct work? Can I tee off the dryer line and connect a bathroom exhaust pipe to the same line to avoid having two outlets 2 feet from each other on the outside? Dryer does not have a back draft damper. Bath exhaust fan has a cheesy back draft damper. When just one is running, moist air will back draft into the other. Therefore, you will make it worse instead of better. When both are running, the duct is too small. The dryer will still blow back into the bathroom. Just a bad idea. Can my return air plenum cause my floors to rot? Can you install fan into hvac duct? 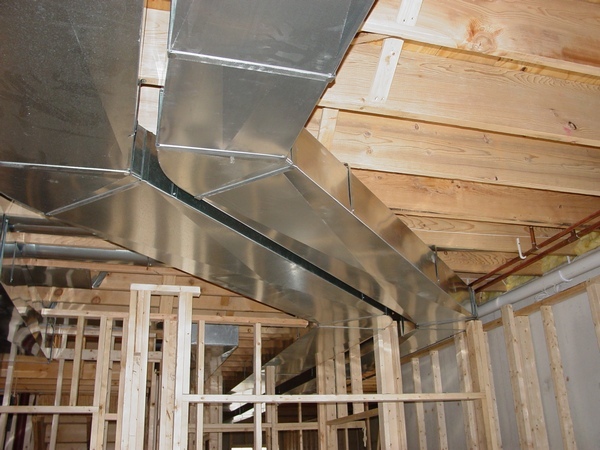 Can you use the same ductwork in a house if you enlarge the unit? Can you vent a basement bathroom fan into cold air return? Well, this question is not as stupid as it seems, because in the big, multilevel commercial buildings they vent it right into ceiling plenum. However, unless you want to play a game: Guess what grandpa ate for breakfast, never do it in your house, period. Did I hurt my furnace when cutting through a/c wire? Probably not, however you may have blown up the fuse. Do I have to use my cold air returns if I get a high efficiency furnace? You are probably referring to the combustion air intake, you may need it then for your water heater. Do I need a cold air return in my crawl space? Do I need to insulate my cold air return ductwork? Do rooms with cold duct returns be open or closed? They can't be closed - this is one of the reasons why they can't be closed. Exactly one month ago to the day, the following American Standard system was installed at my residence: 3 ton, 20 SEER Platinum Series variable speed heat pump; 3 ton variable speed air handler; AccuClean Filtration System; two zones; and all new duct work. Yesterday, I walked in the house a smelled a very sour odor ("dirty sock syndrome?"). This odor was coming through the registers from the air handler. At times the odor will completely disappear and the air coming from the registers is as fresh as it was the first day. Then for no apparent reason, the sour odor will return. My air handler is installed under the house in a crawl space where I maintain a relative humidity of 45-50% using a dehumidifier. When I emailed my contractor about this odor problem, he was able to look at my thermostat control using an online link. His response was, "let's start by changing the fan control from "on" to "auto." I unknowingly had been running the fan continuously for a month. I immediately did this and began to notice a drop in my indoor humidity over the next day. Also, the sour odor has completely disappeared. I guess less moisture in the return air means less moisture in the air handler and the vicious cycle is interrupted. Somehow this has had a positive effect on eliminating the bacterial odor. I had noticed indoor humidity levels ranging from 47 to 52% during the first month of operation with the unit set to "on" continuously. When I changed it to "auto" it was at 52%. It has dropped to a range of 44 to 48% with the fan in "auto" mode and all problems have disappeared. Gas fireplace listed as no vent fireplaces for LP and Nat Gas... how does this work with no vent? Wouldn't that be a CO risk? Just curious on how they can get away without venting a gas one. These units are equipped with an oxygen sensor that will shut the appliance off if the O2 in the room falls below a safe level. It heated the room but it always smelled and it shut off on the O sensor all the time. Also, if you or anyone in your family has asthma or any other respiratory issues, you should not use a ventless fireplace or heater. 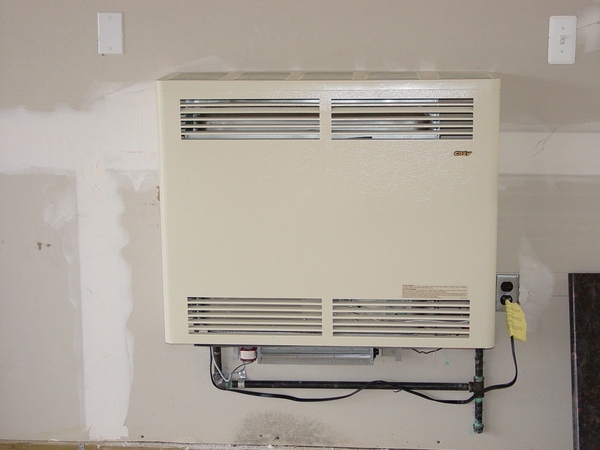 Have you heard of putting the heat pump inside coil on return side of a residential system gas furnace instead of on supply side after heat exchanger? It's a good way to ruin a heat exchanger. The super cold air will cause the furnace heat exchanger to sweat and rust profusely causing premature death of furnace. It's the moisture in the air inside the heat exchanger that is the problem. It will condense and rot your heat exchanger from the inside out. How do I fix cold air ducts sweating in basement? Normally, a cold air duct is not sweating in the basement. However if your basement is very humid you may drop a cold air return to your basement or/and put a dehumidifier there. Buy a dehumidifier on the right or on the left. How do I install a new duct and a wall register in an interior wall? I have it in Chapter #5 from my Ductwork Installation Guide book dedicated to this issue. How do I know if my kitchen system has a vent damper? If you feel draft from your kitchen hood then it definitely doesn’t have a damper. How do you attach ductwork to floor? How do you attach insulation to duct work? You can attach insulation with the "silver" tape. How do you close the fresh air intake? I wouldn't completely close a fresh air intake. How do you use a downdraft furnace in a basement? 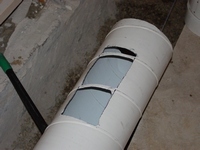 In a basement, you can use a downflow furnace if you are using it for the underground system of ductwork. How far can gas furnace PVC vent pipe be exposed outside? Look in the installation manual, there are all dimensions posted. How far down wall, do you need to install heat ducts for wall registers? For the regular house - 7" off the floor. How high from floor should return grill in wall be put? In general, 8" off the ceiling. How important is cold air return? Try to breathe out, but do not inhale, got the answer? How to add a furnace vent to a finished garage? If you are asking about a garage heater then get info on Chapter #58 from my Ductwork Installation Guide e-book. 308.0 Location. Link to the International Code added (11/05/2012). How to correct high static pressure on a furnace? How to cut ductwork at wall? The easiest way to cut ductwork at the wall is with a saw-zall or grinder. And you can buy them on the right. How to do a split-level kitchen remodel? Learn it on the Split-level House Ductwork Installation page. How to drop heat runs to floor in basement? I have a paid page to answer your question. How to duct large amount of combustion air to boiler room? In general you have to install a rectangular sleeve through the wall. On the inside mount a grill. Outside, install a hood with a screen at the bottom. How to fix off balance inducer motor on furnace? Do not fix it - replace it. (Furnace Repair video player, 15-th video). How to install a furnace for the first time? You do not want to know that, hire a contractor. But you can buy a furnace yourself here on this page. How to install a return air duct in hvac system? I have several chapters in my Ductwork Installation Guide e-book dedicated to this issue, just check them out. How to install air register in drop ceiling? I have a step-by-step tutorial for this topic on this page. How to install air supply boots in attic? Learn how to install supply boots in the Chapter #56 from my Ductwork Installation Guide book. And you can buy them on the right. How to install ductwork for kitchen ventilation? Learn how to do that in my Kitchen Remodeling Edition e-book. How to install ductwork under house? Just the same way that you would you install it in the basement. How to install exhaust from garage heaters? Learn how to do that in Chapter #62 of my Ductwork Installation Guide book. How to install metal ductwork hangers? You can nail them with 2 ¼" spikes or screw them with 1" - 1 ½" zip screws. How to install natural gas furnace forced air heating in a crawl space? If you have other options, never do that. How to install riser ductwork? Sometimes it could be tricky, just check out Chapter #42 from my Ductwork Installation Guide book. How to install wall vent cap for microwave? You can get an answer to this question in the Chapter #27 from my Ductwork Installation Guide book. How to insulate ductwork insulation? Just wrap it in the same type of insulation, whish you already have on your ducts. If you live in a humid environment do not bury ducts under blow in or other type of insulation because you need to provide a vapor barrier. How to measure a plenum for a furnace? It should be ¼" large then furnaces flange and 1" off the joists. How to put ducts together? For this one and for related questions I have answers on this page. How to put ductwork in for a propane furnace? The same way as for any kind of furnace. How to raise register duct work in wall cavity? You have to open the wall, cut bath box’s sleeve with a saw-zall, remove nails that holding the bath box in place, add piece of pipe, put the bath box on it and nail to the studs. Buy a saw-zall on the right or on the left. 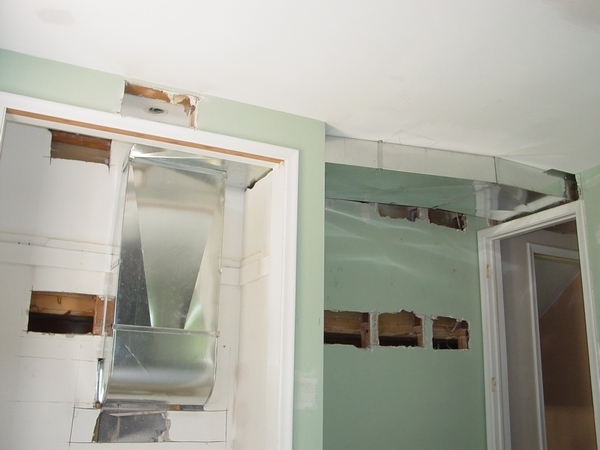 How to relocate air conditioning ducts is a kitchen renovation? Get the answer to this question and more in the Kitchen Remodeling Edition e-book. How to seal ductwork in attic? Just the way you can seal any other ductwork. How to secure PVC on high efficiency furnace? You can use ¾" clamps. How to size cooling coil condensate pump? They all the same, but some of them has low profile. How to use dampers for air return? They never install any dampers for air return in a house, but you may need them for the finished basement. I have a 220V mini split AC I'm in process of installing. I had an electrician install a disconnect box outside for the unit. I installed the whip wire running from AC to the disconnect box which is labeled "Line" for either side which from my understanding can be mixed on either side without issues. When I put my little tester on either wire, it beeps for both so they are both hot. Now, when I wire the wires from whip to the AC, I have "L1", "L2" and "Ground". Ground is understood, no issues there. However, with L1 and L2, any possibility that I can install them backwards? It is a heat pump AC so I'm just wondering if it is backwards will it run in heat pump instead of AC mode? There is no backwards with a single phase 208/230V line. Ground to ground and each leg to the high voltage terminal block. I have working experience in ductwork. So do I, what is your question, type it on this page. In my kitchen more than six feet from where the nearest vent is my lower cabinets, their contents and the floor are very warm. I’m talking my wooden spoons in the top drawer four feet off the ground are warm. The space is above where the unit sits in the basement but the heat I’m feeling feels pretty extreme. Where I start to figure out what is going on? The lower cabinet space between the floor and bottom of the cabinet is used as a supply air chase. This causes heat transfer to the items in the cabinets. During construction a hole is made in the floor and the supply air duct attached to it. Then the cabinets are set on top of the hole and the supply air grill is attached over a hole cut out in the cabinet kick plate. That lower void in the cabinet framing becomes a supply air chase. Make sure a toe kick 90* is installed, otherwise install it yourself. Is it bad to block heat runs with furniture? It depends on how big this piece of furniture is and how close it sits to the register, but the most harm could be done to the furniture itself. Is there any type of wood furnace which you can add ducts? You can find a tutorial on the Furnace Replacement in Pictures page. Is there debate of closing off rooms to save electricity? Yes, but I would not recommend to close off even one room in order to save energy. More info is on this page. May I use crawlspace as furnace plenum? Should cold air duct be next to supply duct? It is not necessary, but then system of ductwork looks better. Should flex duct be installed under attic insulation? Yes it can be installed under attic insulation if you provide an additional vapor barrier. Should I buy a house that has sweating ductwork in the crawl space? Should I get a cover for my Air Conditioner for winter season? You do not want to put a cover (all around) the unit; it needs to breathe. A cover also makes a nice home for critters. I have a piece of plywood, which is slightly larger than the fan grill. When the leaves start to fall (and not running a/c), I cover the grill. After all leaves fall down, I remove it. However if you insist you can buy it on the right. Should you close a/c vents to push more air to the furthest room? You may do it; they call it system balancing, but be cautious and do not close to many vents at once. Learn the other methods to achieve this goal on this page. What does that mean when they saying that the "HVAC brand does not matter, the installation quality is more important"? Sizing the equipment and duct work to home, following industry standards and procedures, benchmarking equipment after installation to prove performance, charging what the market will bear and providing as little as possible. What goes wrong if there is water under the furnace? In the summertime it could be clogged condensate line from you evaporator coil. In the wintertime it could be broken hoses from the inducer motor, or from you humidifier. What happens when I use a smaller than recommended duct for my microwave exhaust? It won't remove as much contaminated air as designed, it will be noisier and it may shorten the blower's lifetime. What I can do if microwave exhaust duct too small? What is formula for to find the minimum length for a duct offset? Answer to this and to related questions you can find on this page. What is the best way to insulate h/ac ductwork in basement? Just follow the step-by-step instructions on the Ductwork Insulation page. What is the best way to run ductwork in attic? Top of the Line House. What is the normal interval of furnace to come on and off? It’s almost entirely depends on the outside temperature and set temperature on you thermostat. However there are a lot of additional factors that could influence the furnace cycle. Get more info on this page. What needs to be done to move an air handler from soffit to a stand on the floor? Lots of duct work. Line set lengthened or shortened. Electric re-ran. What should I do duct wise to add computer room to garage? This is a complicated issue, but you can resolve it by visiting this page. What type of tape do I use to seal ductwork? You can use a silver tape, but for better results use a duct sealant. Where can I drain the condensed water from my high efficiency furnace? You can drain it into the floor drain or if you do not have one, use a condensate pump. Buy one on the right or on the left. Where I can find kitchen hood exhaust duct installation over the range? Right here on this site. And you can buy installation kit on the right. Where I can find wall register installation video? This is a very simple DIY project and you do not need any videos to learn it, just learn about this type of installation in the Chapter #52 of my Ductwork Installation Guide book. Where I can see pictures of ductwork system with a chase? You can see it on the Ductwork in Attic Installation page. Why am I having too much humidity from a/c unit inside home? This one is a complicated issue, but as a first remedy you may try to reduce your A/C blower speed. Why cold air return air ducts running outdoors? It is not a cold air return duct - it's a fresh air intake. Why do my a/c vents whistle in my home? Most likely they are too small, or you have to use different type of registers, or you have to add some more. Why does basement have to be so cold? This is and interesting question - got the answer? Why does my furnace have a flex duct pointing at the floor? Most likely, a flex duct that you are referring to is a combustion air intake. Why must a mini split condenser "be level"? Because it will reduce the noise and prolong condenser's life and efficiency. Why not insulate plastic flex duct for bathroom? Because it is much easier to replace it with the insulated one. Why there is dripping sound in wall when heat is on? Get an answer to this question on this page. Why would I have a ductwork box on the bottom of the gas furnace? Probably for a cold air return. Will a dehumidifier work in the attic? Only if your attic is sealed. Will a fresh air vent to my house stop my gas water heater from back venting? Will closing supply vent stop banging? No. Get more info on this page. Will every chimney make ticking noises? No, but if you have this problem, find a solution on the Ticking Noise Elimination page. Will adding air intake near the floor help warm up a room? Not necessarily, but you can get more info if you will read a pdf file on this page. Would block air vents ruin furnace? Yes, if you wouldn't follow my recommendations.